Commonwealth Golf Club is a close neighbour of The Metropolitan and Yarra Yarra Golf Clubs, the three forming private golfing oases in modern Melbourne’s southward suburbs. Commonwealth’s golfing origins date back to 1915 when 11 enthusiasts came together to form the precursor club of Murrumbeena which changed its name to Waverly Golf Club upon the lease of new lands. Commonwealth was instigated in 1920 when the club settled on the present location off Warrigal Road. By 1926 and for the first time the course was laid out as an 18-holer. The early work on the design was performed by the club’s professional Sam Bennett but the bulk of the improvements and upgrades were done by a club captain of the time Charles Lane who had ventured overseas to study course architecture. The course meanders efficiently. The holes sometime loop and other times back-up on one another so the golfer will always face differing conditions if there is a breeze blowing. Although the land has been very well used with all holes running along side at least one other hole, you play along the fairways with a high degree of isolation due to the maturity of the bush that has grown up along the edge of the fairways. Commonwealth has some of the finest examples of Australian bush trees in the State of Victoria. Grand examples of mature eucalyptus, wattle, pine, gum and peppercorn line the fairways. The 7th, 11th, 15th and 16th are holes that the golfer will recall for a long time after the round at Commonwealth has finished. The course will tempt you into errors that make you curse all the more for having been apparent. A handicap maintained at Commonwealth would render most golfers pretty competitive versus their peers at other clubs. 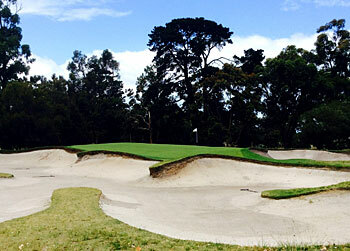 Commonwealth GC is a superb test of golf for all standards of player. It's a strongly tree lined course with traditional sandbelt type bunkering surrounding the greens, the course has some water on it at the par 4 3rd with the dam located on the right hand side and the 16th which is positioned on the left side of the fairway and is unusual for it's neighbouring courses down these parts. The short Par 4 first is excellent with it's risk reward as well as it's closing hole the 18th with it's wonderful green setting around the clubhouse. It can be tight off the tee here, but whether the club decides to embark on a tree removal program then it will remain this way. The course routing is fairly well up and back, north south facing with not one hole running directly east or west. The variety in length of holes was excellent as well, not all the same length can kill course makeup, some dogleg holes here make for testing tee shots. Commonwealth is a great course. It subscribes to the strategic school of design and holes 9, 11, 14, 16, 17 are perfect examples of this.In the late 1980s/early 1990s the course was lengthened and some holes re-designed (1,6,7,12) by an ill-advised committee. These re-designs ultimately lead to some of the best short holes in the Melbourne Sandbelt being lost (1 and 7).Unfortunately, the loss of these two holes and lack of tree management program has weakened the course. If the Committee were to restore the holes lost in the late 1980s/early 1990s and commenced a strict tree removal program, Commonwealth would easily be a 5-star course and be uttered in the same breath as Royal Melbourne, Kingston Heath and Victoria as gems of the Melbourne Sandbelt.